We are very excited you are considering St. Andrew's as a location for your wedding. Our desire is to provide a wedding that will be meaningful and memorable to you. St. Andrew’s Presbyterian Church is located in Newport Beach. Our Church has both a sanctuary and a chapel available for your wedding ceremony. Grace Chapel seats up to 200 persons and the Sanctuary seats up to 1200. St. Andrew’s maintains a wedding calendar up to one year in advance, so we recommend that you book your wedding 6-12 months prior to your desired date. 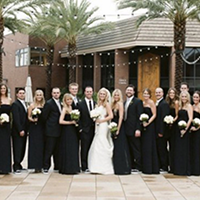 Please schedule an appointment with one of our wedding coordinators to tour our facilities. If you would like to reserve a date, you will be asked to submit a Marriage Information Form, a Facility Use Agreement Form, and a deposit of $500. The tentative date will then be placed on the Church calendar for approval. The wedding date will be confirmed by one of our wedding coordinators within 30 days after scheduled. If the date cannot be confirmed, the deposit of $500 will be refunded. Once the date is confirmed, your deposit is non-refundable. All remaining fees are due on the day of the rehearsal. It is expected that wedding ceremonies are conducted by our Pastoral Staff. The Pastors must ascertain that either the bride or the groom is a professing Christian. 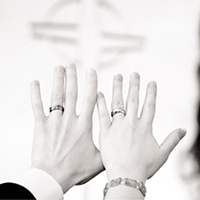 Prior to the wedding you may request, or be assigned, a minister for the ceremony. A visiting Pastor may share in the ceremony upon agreement with our Pastoral Staff. Please submit a written request to our wedding coordinators for approval. Wedding ceremonies at St. Andrew's Presbyterian Church are conducted by our Pastoral Staff. Prior to the wedding you may request, or be assigned, a minister for the ceremony. At that time you will need to contact the pastor’s administrative assistant for premarital counseling. It is expected that each couple will attend a minimum of one premarital counseling session with the officiating pastor. A visiting pastor may share in the ceremony upon agreement with our Pastoral Staff. Upon written request, an outside Christian pastor may officiate. Please contact the Wedding Coordinator with questions or for clarification. Q: Is there a security deposit for St. Andrew's? A: Yes, there is a $500 security deposit required for wedding venue. Q: Do we have to be church members to be married here? A: No, both members and non-members are welcome. Q: Is premarital counseling required before we can get married at St. Andrew's? A: Yes, a minimum of one premarital counseling session is required for each couple before they are married. Q: Is St. Andrew's a full service venue? A: St. Andrew's is a full service wedding venue. We do not have facilities for receptions, however we can provide facilities for rehearsal dinners. For more details please contact one of our wedding coordinators. Please contact one of our wedding coordinators if you have any questions or would like to schedule a time to visit. You may contact us at rachels@sapres.org or 949.574.2205.